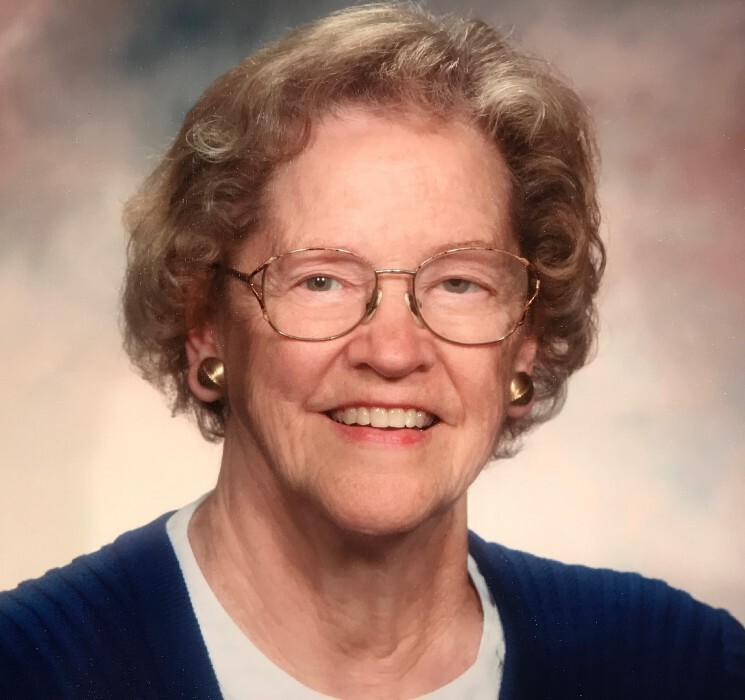 Margaret Ann McFarland Christensen, 93, passed away on December 6th, 2018. She was born December 7th, 1924, in Kansas City, Kansas, to Orliff Elmer ‘O.E.’ and Margaret (Morris) Smith, and had two siblings, Robert and Janet. Her father’s career with the S.S. Kresge Department Store chain required many moves until the family settled in Warren, Ohio, in 1936. After earning her BA in education at Ohio State University in Columbus, Margaret taught English in Warren before returning to OSU for an MA in Spanish. On campus she ran into Philip McFarland, a friend from Warren. They married on September 10, 1950, and started a family while Phil was in medical school at OSU. In 1954 the family moved to Dearborn, Michigan, for Phil’s medical residency at a hospital in nearby Detroit. Finally, in 1959, Margaret and Phil moved across the country with their children, Randy, Don, Mary, and Bill, to settle in Fullerton, California. There, Phil began his orthopedic practice and Margaret raised the children while volunteering in their schools, their Sunday school classes, and throughout the community. She was very involved with the Fullerton First United Methodist Church, as well as Girl Scouts, Weekday Christian Education’s Meals on Wheels, Las Campanas, P.E.O. (President 1982-83), and Assistance League, to name a few. In her spare time she enjoyed playing tennis, reading, listening to classical music, and sewing with her long-time sewing group. She bravely joined Phil for skiing, sailing, trap shooting, and flying. After 47 years of marriage, Philip passed away on April 17, 1998. Two years later, Margaret moved to ‘Morningside of Fullerton’ retirement community where she lived for the rest of her life. It was there, in 2007, that she met Dr. Les Christensen, and they married on Sept 15, 2008. After four short years, Les passed away on April 29, 2012. Margaret’s family visited her often over her remaining years, until she passed away on December 6, 2018, from end-stage dementia while struggling to recover from a broken hip. Margaret was generous, caring and devoted. She loved to laugh, was kind to all, and always put others first. She will be missed very much by all who knew and loved her, especially by her children. Her family wishes to thank the staff at Morningside, Park Vista and The Gardens, for the wonderful care they took of her in her 18 years there. Margaret was preceded in death by her husbands, Dr. Philip Howard McFarland and Dr. Leslie Earl Christensen; by her brother, Robert L. Smith; brother-in-law, Barrie Smith; and sister-in-law, Mary Beth McFarland. She is survived by her four children: Randall (Ellen) McFarland, Donald (Becky) McFarland, Mary (Gregory) Montevideo, William (Suellen) McFarland, and by Teri McFarland; eight grandchildren and ten great-grandchildren (all in California). She is also survived by her sister, Janet E. Smith, of Fort Myers, Florida; brother-in-law, David McFarland, of Sebring, Ohio, and their families. A private family graveside service will be held at Memory Garden Memorial Park, Brea, CA. Friends and family are invited to an open house, at a different location, on January 12, 2019, from 12:30 - 4:00pm, with shared remembrances starting at 1:30pm. In lieu of flowers, donations may be made in her name to: Fullerton Methodist Foundation, 114 N. Pomona Ave, Fullerton, 92832; Weekday Christian Education Chapel on Wheels, PO Box 5281, Fullerton, CA 92835; P.E.O. Chapter LC, 530 S. Madrona, Brea, CA 92821; or your favorite charity. Arrangements are by Memory Garden Mortuary, Brea, CA.